After their final conference game against HLV last week, the Lynnville-Sully baseball team was able to claim the 2017 conference title. It was an exciting game for the Hawks, who were playing for the conference title on Wednesday, June 28. The L-S boys brought the game into an extra inning, winning 6-5. "[It was a] huge win for us in the aspect of overcoming challenges during the course of the game as well as bringing home the first conference championship since 2001," commented head coach Bob Scandridge. "This team believes in each other, and they seem to find a way to keep battling and give themselves chances." The Hawks had an early disadvantage, giving up two runs in the first. They were able to battle back in the third inning by scoring three runs to take the lead right before a one-hour lightning delay. HLV answered back in the fourth with a run and then two more in the fifth. The Hawks rallied for two in the sixth after sophomore Evan Squires had an RBI single to score freshman Bray Noun Harder. Senior Caden Dunsbergen followed, driving in junior Corbin James to tie the game. Both teams went scoreless in the seventh inning. In the extra eighth inning, sophomore Rylan James led off with a single and made it home on a two-out single by Squires. The Hawks played solid defense in the bottom of the eighth with a double play and a game-ending diving catch by C. James to seal the conference championship. Coach Scandridge noted the Hawks have had “so many players come up big during the season.” That includes Squires, who went two-for-two at the plate with both hits driving in runs. R. James went two-for-four on the night. Dunsbergen had one RBI and stole two bases. Junior Josh Dunsbergen started the game for the Hawks, throwing 4-1/3 innings. In that time, he threw an impressive six strikeouts. He allowed seven hits and four runs. Junior Elijah Collins came in to relieve him, striking two out and allowing two hits and one run. The Hawks (15-5) were set to take on Eddyville-Blakesburg-Fremont on Monday, July 3. They will travel to PCM on Wednesday, July 5. Post-season play starts on Tuesday, July 11, at Colfax facing Melcher-Dallas at 5 p.m. The winner will play at Twin Cedars, Bussey, on Thursday, July 13, at 5 p.m. against the winner of the July 11 Moravia and Moulton-Udell game. The L-S JV boys went 3-1 in their most recent games. 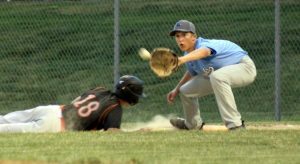 At Montezuma on Wednesday, June 21, the boys suffered a close 6-5 loss to the Braves. They scored four runs in the third inning but came up short. Freshmen Kinnick McFarland and Blaize Kuhlmann, Squires, junior Cody Gibbs, and Josh D. all scored for the Hawks. McFarland pitched a good game but took the loss. The boys rebounded with a 5-4 win over North Mahaska at home on Friday, June 23. The Hawks had to work to score sophomore Abram Collins in the bottom of the fifth to get the win. A. Collins reached base on a walk and was advanced by freshman Slater Young. Freshman Skyler Jannenga was intentionally walked to load the bases, and A. Collins scored the needed run on a wild pitch play. McFarland, Kuhlmann, and Squires all scored once, while A. Collins had a nice night, scoring twice and reaching base safely in his three at-bats. The JV team earned another win with an 8-0 victory over BGM on Monday, June 26. The Hawks scored five runs in the third inning. Kuhlmann scored twice. Squires scored twice and reached base safely all three at-bats, including a triple. Young, R. James, A. Collins and Jannenga all added runs for the Hawks. R. James got the win. Noun-Harder came in as relief to seal the victory. “It was another good team win for the Hawks with so many kids contributing at the plate and in the field making plays,” Coach Kevin Johnson said. A few days later, L-S picked up another win by topping HLV 5-2. Kuhlmann pitched a complete game and scored once for the Hawks. A. Collins, Jannenga, Wyma, and freshman Logan Ingersoll all scored for the Hawks as well. Freshman Slater Young catches the ball as he tries to get a baserunner out at first in the JV game at HLV.